Tech Tip: Take the guess work out of knowing when to replace the Door Gasket on your Tuttnauer 1730MKV (VALUEKLAVE) Sterilizer. Keep a record of when maintenance procedures are performed and mark the calendar when they are due to be performed again. Tuttnauer 1730MKV (VALUEKLAVE) Gasket Installation Tip #2 - For easy install of the new gasket, use the "star" or "North-South-East-West" method (ie. 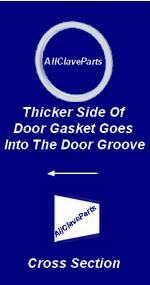 begin installing the gasket at the top of the door, then the bottom, then the left side, then the right side, and then everything in between making sure that the gasket fits flush without bumps or gaps). I'm happy so far, so long as my order arrives in a timely manner it'll be great-thanks. Will definetly recommend to anyone looking for the autoclave. I will go back to buy again. Thank you! !